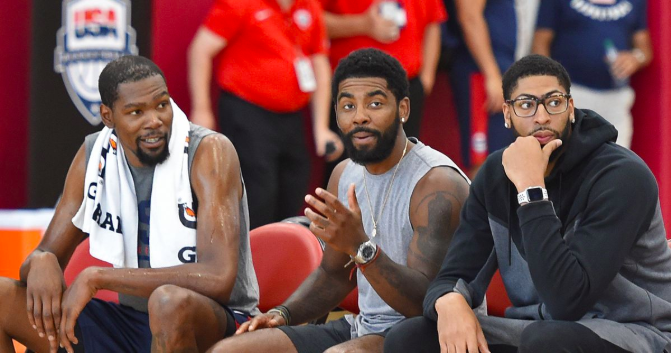 Kyrie Irving, Kevin Durant, and Anthony Davis, headline this summer’s NBA market. With the regular season coming to an end, teams are looking to boost their team’s roster for next season. Teams are trying to beat the notorious Golden State Warriors, referring to them as “The Superteam,” “The Dubs,” or even “The Death Lineup.” Teams are longing a superteam of their own. Boston’s biggest free agent, Kyrie Irving, is causing many fans to raise questions about his future with the Celtics. “I honestly don’t think we need Kyrie to sign this offseason,” said junior Jake Ross. Another big target on the market, Kevin Durant, is widely disliked by a lot of fans around the league. Accused of starting a “superteam” in Oakland with the Warriors, Durant is looking to either resign or look for a future elsewhere to continue his overall dominance. “I hate Kevin Durant, but that doesn’t negate the fact that he’s really good at what he does. I think he’s not going to resign with the Warriors. I mean, the whole reason he went to Golden State is because he wanted to win a championship. After two championships and two Finals MVPs, he’s accomplished everything he set out for. I see him going to either the Lakers or the Knicks,” said junior Cameron Baker. Lastly, the largest talk and arguably the most dominant center in the league, Anthony Davis is looking to end his tenure in New Orleans and head elsewhere to continue his professional journey. “I had high hopes. When you play somewhere for a long time, seven years — or six and a half, I guess — and all I know is New Orleans. I have always talked about just winning. For me, I just feel like it’s my time. Like I said, you don’t know how long you’re going to play this game, and I feel like I’m in my prime, playing at an elite level. I want to make sure I take advantage of that,” said Anthony Davis. “I just want to win, man. That’s the biggest thing for me. All the All-Star selections and gold medals are fine — I definitely want to win another gold medal. But for my team, I want to win, ” Davis added. “I want AD[Anthony Davis] in Boston. I think that would be so cool. If Kyrie stays, which I think he will, it will be Irving, Brown, Hayward, Tatum, and Davis. That lineup would be a championship lineup,” says junior Kyle Sullivan. “I’m very excited to see what happens this offseason. I obviously want Kyrie to stay, despite what others are saying about him. As far as the rest of the league, there will be big players who will strongly influence the league. Players like Davis and Durant headline this offseason. Will the celtics get both of them? Probably not. But I’m curious what will happen to them,” Freshman Ryan Baker said. ← Can Beauty Pageants Promote Feminist Ideals?